White mold of watermelon – Usually when I write about a vegetable disease it is because the disease may cause important economic loss. Once in a while, however, a disease I find is more a curiosity than a real problem. So, go ahead and read this article about white mold of watermelon. But please don’t worry about this disease. Simply, watch for these symptoms and let me know if you have questions. Readers may have heard me ‘talk’ about white mold of tomatoes. The fungus that causes white mold, Sclerotinia sclerotiorum, has a wide host range. Important hosts include bean, cabbage, potato, lettuce and sunflower in addition to tomato. More about the disease on tomato can be found here. If you have never heard me talk about white mold of watermelon, don’t feel left out. I don’t talk about white mold of watermelon since I have only observed the disease twice in 21 years. The second time was a few days ago. I think it is time to document the disease here. Both times that I have observed the disease on watermelon it has been on transplants still in a tray. The disease can be recognized by the white mold that covers the plants (Figure 1). However, other diseases can cause a white mold on watermelon transplants. The diagnostic feature of white mold, whether on watermelon or tomato, is the dark, irregularly shaped sclerotia that form on and in the stems of infected plants (Figure 2). Figure 1. White mold of watermelon. Note dark sclerotia. Figure 2. White mold of watermelon. I have never observed white mold on watermelon plants in the field. However, one should avoid planting affected seedlings. 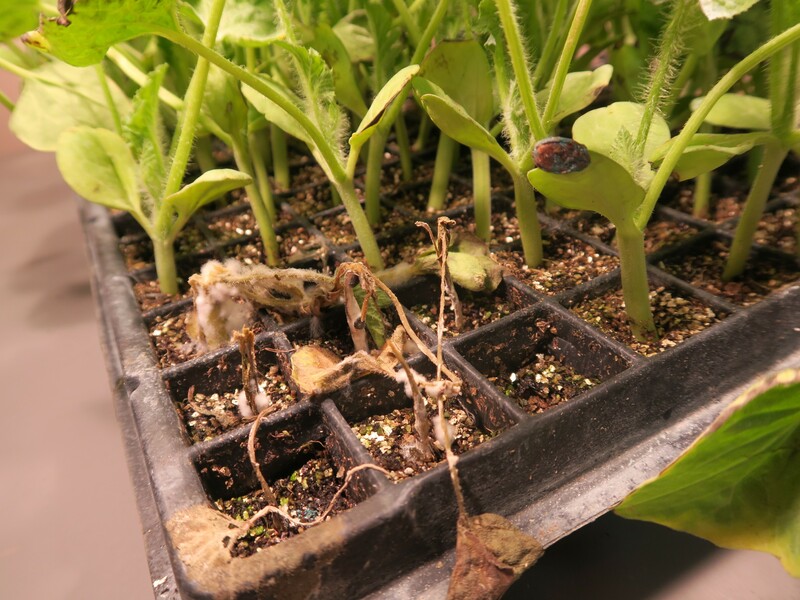 Discard affected transplant trays far away from production areas. Sclerotia can cause the spread of the disease next year (this is more of a risk for next year’s tomato than watermelon) and so should be destroyed. Keep the area around transplant production greenhouses clear of weeds and debris. 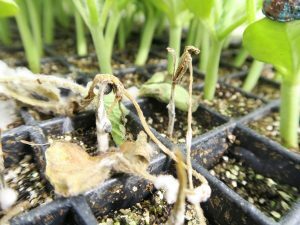 If seedlings infected with white mold happen to be planted, it is unlikely to cause problems for watermelon, if history is any indication. For more about white mold, see the link above. While this disease has not been important on watermelon, monitor for the symptoms and get an official diagnosis if necessary.